Thomas Cole (American [born England], Lancashire 1801–1848 Catskill, New York). View of the Round-Top in the Catskill Mountains (Sunny Morning on the Hudson), 1827. Oil on panel, 18 5/8 x 25 3/8 in. (47.3 x 64.5 cm). Gift of Martha C. Karolik for the M. and M. Karolik Collection of American Paintings, 1815–1865 (47.1200). Celebrated as one of America’s preeminent landscape painters, THOMAS COLE (1801–1848) was born in northern England at the start of the Industrial Revolution, emigrated to the United States in his youth, and traveled extensively throughout England and Italy as a young artist. He returned to America to create some of his most ambitious works and inspire a new generation of American artists, launching a national school of landscape art. Opening January 30 at The Metropolitan Museum of Art, the exhibition Thomas Cole’s Journey: Atlantic Crossings examines, for the first time, the artist’s transatlantic career and engagement with European art. With Thomas Cole’s masterwork The Oxbow (1836) as its centerpiece, the exhibition features more than three dozen examples of his large-scale landscape paintings, oil studies, and works on paper. Consummate paintings by Thomas Cole are juxtaposed with works by European masters including J. M. W. Turner and John Constable, among others, highlighting the dialogue between American and European artists and establishing Thomas Cole as a major figure in 19th-century landscape art within a global context. The exhibition marks the 200th anniversary of Thomas Cole’s arrival in America. Oil on paper laid down on canvas, 8 3/4 x 10 7/8 in. (22.2 x 27.6 cm). The Metropolitan Museum of Art, New York, Morris K. Jesup Fund (2013.201). 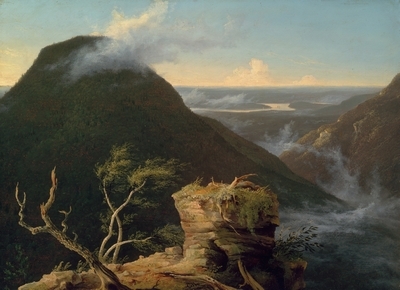 The exhibition follows the chronology of Thomas Cole’s life, beginning with his origins in recently industrialized northern England, his arrival in the United States in 1818, and his embrace of the American wilderness as a novel subject for landscape art of the New World. Early works by Thomas Cole will reveal his prodigious talent. After establishing himself as the premier landscape painter of the young United States, he traveled back to Europe. 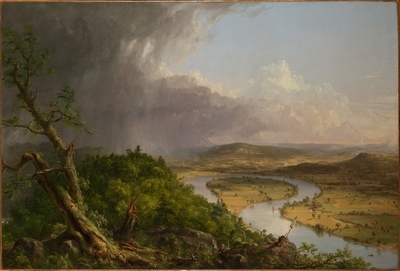 View from Mount Holyoke, Northampton, Massachusetts, after a Thunderstorm—The Oxbow, 1836. Oil on canvas, 51 1/2 x 76 in. (130.8 x 193 cm). The Metropolitan Museum of Art, New York, Gift of Mrs. Russell Sage, 1908 (08.228). The next section explores in depth Thomas Cole’s return to England in 1829–31 and his travels in Italy in 1831–32, revealing the development of his artistic processes. He embraced the on-site landscape oil study and adopted elements of the European landscape tradition reaching back to Claude Lorrain. He learned from contemporary painters in England, including J. M. W. Turner, John Constable, and John Martin, and furthered his studies in landscape and figure painting in Italy. By exploring this formative period in Thomas Cole’s life, the exhibition offers a significant revision of existing accounts of his work, which have, until now, emphasized the American aspects of his formation and identity. The exhibition also provides new interpretations of Thomas Cole’s work within the expanded contexts of the history of the British Empire, the rise of the United States, the Industrial Revolution and the American wilderness, and Romantic theories of history. The Course of the Empire: The Consummation of Empire, 1835–36. Oil on canvas, 51 1/4 x 76 in. (130.2 x 193 cm). New-York Historical Society, Gift of The New-York Gallery of the Fine Arts (1858.3). 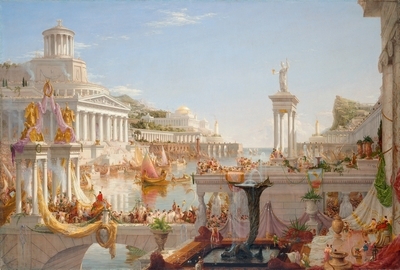 Upon his return to America, Thomas Cole applied the lessons he had learned abroad to create the five-part series The Course of Empire (1834–36). These works reveal a definition of the new American Sublime that comes to its fullest expression in The Oxbow (1836). 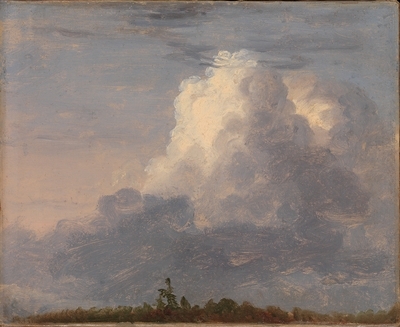 Finally, the exhibition concludes with an examination of Cole’s legacy in the works of the next generation of American landscape painters whom Thomas Cole personally mentored, notably Asher B. Durand and Frederic E. Church. Exhibition design is by Brian Butterfield, Senior Exhibition Designer; graphics are by Ria Roberts, Graphic Designer; and lighting is by Clint Ross Coller and Richard Lichte, Lighting Design Managers, all of The Met Design Department. The exhibition is made possible by The Peter Jay Sharp Foundation. Additional support is provided by the Henry Luce Foundation, White & Case LLP, the Enterprise Holdings Endowment, and the Terra Foundation for American Art. It is supported by an Indemnity from the Federal Council on the Arts and the Humanities.